To take a YarnJourney one needs lots of supplies. So while I was in search of more beads I happened upon a many other items. Items that were on sale since I embarked quite early on Friday morning. The beads I needed were 25 miles away, but they were indeed available and on sale at 40% off. The notions wall was marked at 50% off and I bought a few much needed/wanted notions. 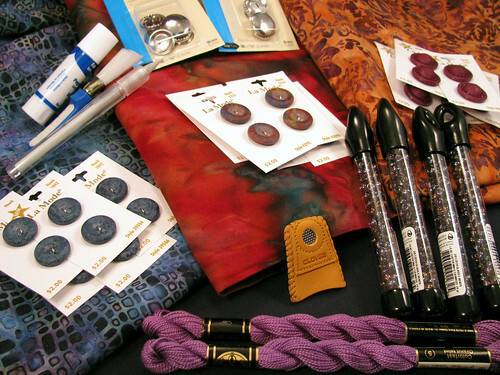 Buttons to cover in beads or embroidery, a marking pencil and a lovely leather thimble I have been eying for a few years. Then I went to Beverly’s which had a coupon for 33% off everything before 10:00AM. I found 3 lovely batiks to make shirts out of. Then back to JoAnn’s for matching buttons at 50% off, and the perle cotton I forgot the first time. So all in all a very wonderful morning, and I am all stocked up to continue on my adventure. This entry was posted on Sunday, November 30th, 2008 at 3:00 am and is filed under Sewing. Tagged: Notions, Sewing. You can feed this entry. You can leave a response, or trackback from your own site.